Chiefly for the logging and sawmills at the Muskoka Wharf in 1880s when the town was founded. And it played an important economic part during and after the Second World War. For Gravenhurst had the best ice around. And we don’t mean for shinny. So says Gravenhurst Archives chair Judy Humphries, who is presenting the amazing story of a 15-year ice-harvesting history in town Wednesday night as part of her local History Lives series at the Gravenhurst Library. UPDATE Wednesday: Jocelyn at library says ‘Judy Talk’ still on despite winter storm. Filling 600 box cars each winter was a massive industry during the Second World War and after. The Canadian National Railways was looking for a new and better water source for its ice during the war than Lake Simcoe, where there was a lot of development. So, a man from CNR’s food quality department came north to re-test the water in Simcoe, and he decided to test Muskoka Lake and Gull Lake. It was the latter that ended up testing and tasting best. Thus began a fascinating tale of how Gravenhurst ice was consumed in CN bar cars and dining coaches coast to coast. And possibly in their national hotels. Humphries knows the story well, and has dug into her archives to reveal details only a few know or remember. “People don’t realize how important (and interesting) the history is here,” she told MuskokaTODAY.com Monday. Ice harvesting had been going on in Muskoka as far back at 1884-85 in Rosseau. She has sketches of that in her presentation. 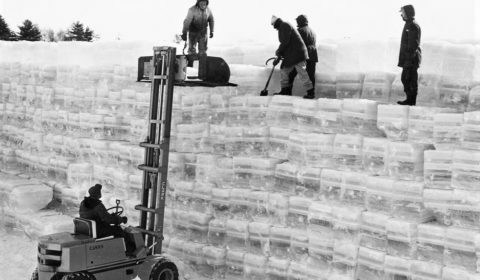 With 24,000 tons a year of ice to produce, conveyor belts were eventually used. But during the war when every natural resource was stretched the limits of human possibilities, even frozen water wasn’t taken for granted in a part of the Canadian shield where we take our rock for granite. Perry Boyd, who was harvesting ice for years south of town in Sparrow Lake, had just moved up to Gravenhurst. Ice boxes and lodges were his customers. In 1943 he got the CNR contract, because he had the “know-how and manpower,” after selling for local ice boxes and to lodges around the lakes. The contract was for 24,000 tons of ice per year. That 600 box cars worth, says Humphries with amazement. Each block weighed 350 to 500 pounds and was 36 inches long by 18 inches wide and 24 inches deep. Sometimes the ice was just 16 inches deep at harvest time. This is how the hobby horses gave way to conveyor belts, railway spur lines and an ice house built in 1944. And how sawdust came to be an integral part of the year-round business. Because it was an all-seasons operation, Boyd and his crew covered it in sawdust and stored in a massive building 180 long, 25 feet wide and 30 feet high — and no roof. Horses pull ice up the small beach road called Moody Drive today on Gull Lake. It was located in a CNR pit next to where the arena is today across the old Hwy. 11 (Bethune Drive today) and beside Gull Lake. Next to the old Rubberset, a wood products factory (YIG today), where some of the sawdust originated. The ice was cut each winter in Gull Lake and hauled up the hill at where today there is a small swim beach and stored in the hut. A railway spur line was built down into the pit to load the ice right onto box cars for shipment and use across Canada. “It’s shocking how much history there is here,” says Humphries, who has developed a well-deserved reputation as a quality presenter and speaker on Gravenhurst history. As a former Ontario Fire College archivist, she comes by it naturally. And as the new pre-eminent general expert on the town’s history, she even jokingly considers herself “a local” after moving here more than 40 years ago with her school teacher husband Hal and just now a new grandson (Benjamin) with her daughter Gillian (also a GHS teacher). “I just love it here, all the history that no other town in Muskoka has. The presentation is Wednesday night at the Gravenhurst Library at 7 p.m.
Get there early all 60 seats fill up fast and often people have to be turned away. Most who come are regulars, “it’s nice and cosy,” says Humphries. Admission, as with all her local history talks, is free. It’s part of her goal, with the Gravenhurst Archives, to spread the history and to encourage future space for the archives in any expanded library. Last year she did five similar talks, including topics on the PoW Camp 20 in town, Swede Town, GHS Tatler yearbooks, sport heroes and the downtown. This year it’s the ice harvest, ‘How they got from Toronto to Gravenhurst: 1865-1965, the town’s long history with medicine, one-room school house and the impact of war on the town. The History Lives series continues throughout the year at the Gravenhurst Library.